Mentioning Bangladesh’s zero tolerance stance against terrorism and violent extremism, President M Abdul Hamid said on Saturday the country is firm to work with the world community to fight against the extremism and terrorism, reports UNB. “There is no room of terrorism in Islam. Bangladesh will work together with Saudi government to end the terrorism and violent extremism,” the President said as Foreign Minister of the Kingdom of Saudi Arabia (KSA) Adel bin Ahmed Al-Jubeir called on him at Bangabhaban here this afternoon. President Hamid also highly appreciated the initiatives of Saudi King to establish Islamic Military Counter Terrorism Coalition (IMCTC) in Riyadh, where Bangladesh joined the coalition as founding member, President’s Press Secretary Joynal Abedin told UNB. Denouncing all kinds of violent extremism and terrorism, he said Islam is a religion of peace and harmony. Bangladesh and Saudi Arabia have a lot of scope to work together in the field of Islamic affairs. 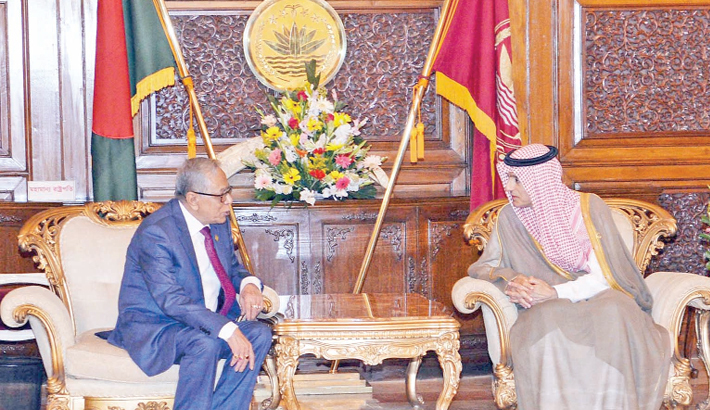 Citing the existing bilateral relation between Bangladesh and Saudi Arabia ‘an excellent one’, Abdul Hamid said the good relationship would strengthen in days to come. He thanked the Saudi Government for opening up job market for Bangladesh workers in all categories and sought cooperation for expanding the bilateral trade and investment between two brotherly Muslim countries.